November 27, 2014 / IMOM	/ Misc. 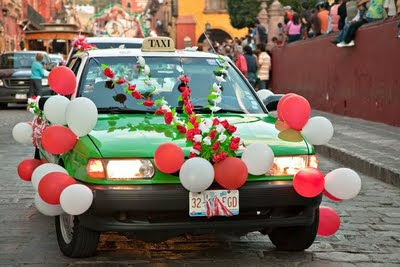 Late one afternoon on, or near, October third around 100 taxis in town will parade down the Real a Queretaro into the jardin festively decorated. Once parked and the driver’s family exits the vehicle, the hoods are opened and a priest with give a special blessing to the cars and drivers for another year of safety and good fortune. Participants in this pilgrimage then enjoy live music and a rosary in honor of Saint Michael the Archangel. This tradition of a year of safe driving and good business started about 20 years ago.